This recipe was adapted from one that appeared in the April 2013 issue of Martha Stewart Living. I usually don't change the original recipe until I try it once but this one begged for a few more ingredients. Also, how do you like my new quartz countertop? I'm loving the kitchen remodel. 2. Add 3 tablespoons olive oil to a large bowl. Add chicken thighs, turning to coat. Salt and pepper to taste. 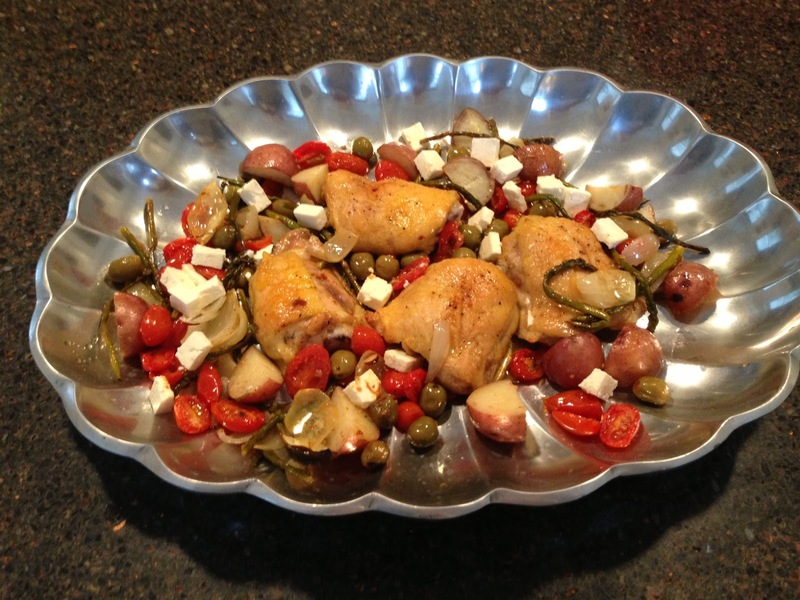 Move thighs to a large rimmed baking sheet lined liberally with aluminum foil (saves on clean-up). 3. Add remaining vegetables to the large bowl and coat with olive oil. You may need more olive oil. Salt and pepper to taste. 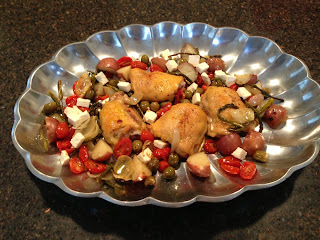 Move to baking sheet with the chicken. This should all be in a single layer so use a baking sheet that is quite large. 4. Roast until a thermometer inserted into thickest parts of thighs (do not touch bones) reaches 165 degrees. This will take 35-45 minutes. Remove chicken to a platter and cover loosely with foil. 5. Return vegetables to oven and roast until golden brown in places, probably an additional 10 minutes. 6. Transfer vegetables and accumulated juices to platter with chicken. Season with salt and pepper if desired (I didn't find this necessary). Sprinkle with crumbled feta cheese. Serve with crusty bread or rolls. Note: Your only clean-up should be the bowl you used to coat chicken and vegetables with olive oil, the serving platter, and your dinner dishes. Very simple!